Just like every other aspect of the FUSION system the tether and reel represent another key aspect to improving the capability, reliability and intuitiveness of the system. The small diameter tether minimizes drag influence on the vehicle for demanding condtions, the kink free ruggedized design ensures reliability while the single point connection and reel with level wind maintain intuitiveness. Since the FUSION is battery powered the tether can be a simple communications line for real time data. The small diameter (2.4mm) single mode fiber optic cable provides a gigabit Ethernet link between the vehicle and the topside. Understanding that fiber can be delicate a ruggedized kink free design is used to produce maximum reliability. Coupling the tether to the vehicle is a single aluminum connector that integrates into the Kevlar strength member. 500 meters (1,640ft) comes standard with every FUSION system and is easily upgraded to 2,000 meters (6,500ft). Tether management is easily accomplished with the included reel system. The reel is a compact and lightweight design that includes a number of useful features and shares the same attention to detail as the FUSION itself. 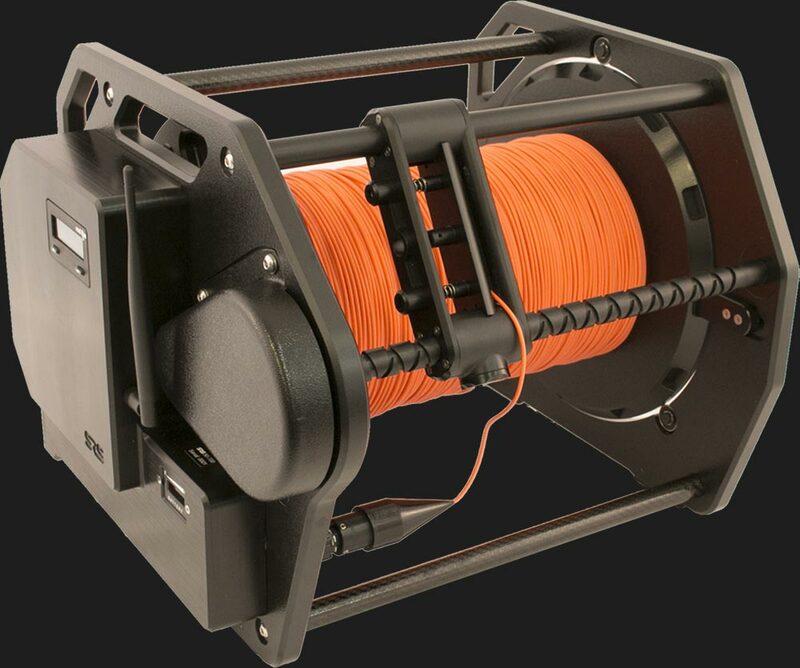 Quiet battery operation, quick change spool, large capacity, rugged design and lightweight. The reel is constructed from composites and hard anodized aluminum. All enclosures and connections are waterproof for use in harsh conditions. Should a tether change be required, such as swapping between the long and short lengths the spools can be changed out in minutes. No longer the requirement to peel off all the tether and respool. If a new tether is ordered it comes already installed on a spool. To simplify tether management there is a level wind that ensures the tether is always spooled correctly. The spring loaded tensioner opens to allow the vehicle connector to pass through if a tether swap is required. On the side of the reel is a digital readout that displays the tether length paid out from the reel. Like the FUSION itself the reel is also battery powered, this means no generator power required. Battery life is a typical eight (8) hours and there is a spare battery included with the system. No tools required to change and a charger is built into the charging case for the FUSION batteries. Copyright © 2019 Strategic Robotic Systems. All Rights Reserved.